Duri signed brooch pin. Possible depicts a feather or a Seattle Seahawks bird head. Pewter with abalone inlay. Estate purchase. I believe this brooch is pewter. 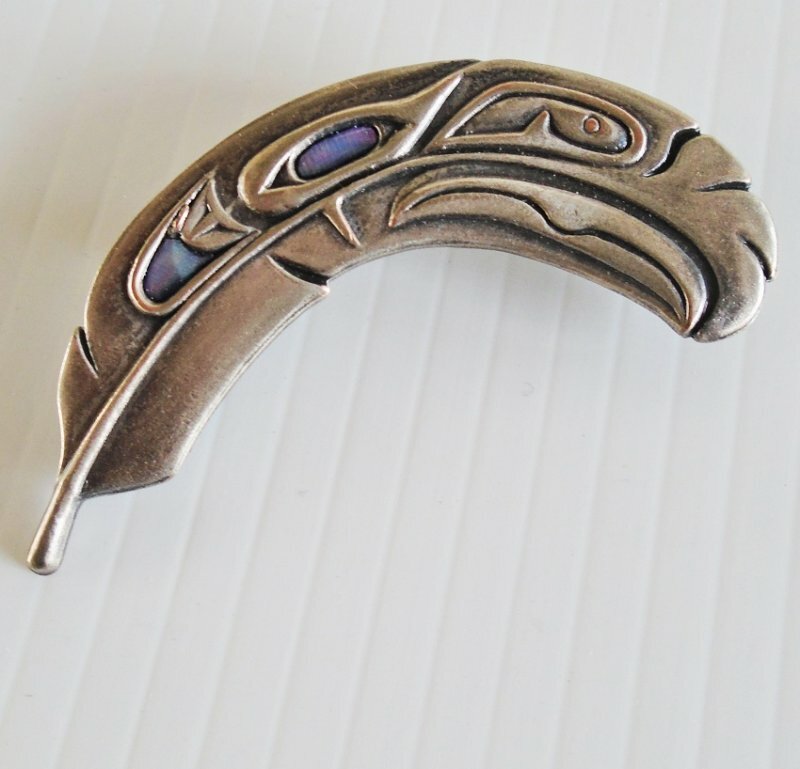 It is Native American inspired and it has antiqued silver tone coloring. There is abalone inlay within its detailed design. It measures 2.75 inches long. It is signed "Duri" on the back. As for a date, I purchased the brooch at an estate sale so I have no personal knowledge of its age. If I had to guess, I'd say it's probably from the 1960s to 1970s. As for what the design actually is, I've always thought it depicted an Eagle or Seahawk head (making it perfect for a Seattle Seahawks fan). But I showed it to a few friends to get their opinion and two of them agreed with me about the hawk's head, and the other two friends said it is a feather, probably from an eagle or other large bird. So, it can be either one, depending on what you want it to be. Buyer to pay USPS Insured First Class Mail parcel delivery charges of $4.99. Shipping is from Arizona.